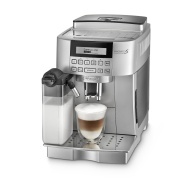 alaTest has collected and analyzed 75 reviews of DeLonghi ECAM 22.360. The average rating for this product is 4.3/5, compared to an average rating of 4.4/5 for other products in the same category for all reviews. Comments about the performance and design are overall positive. The price and maintenance get critical opinions. We analyzed user and expert ratings, product age and more factors. Compared to other products in the same category the DeLonghi ECAM 22.360 is awarded an overall alaScore™ of 88/100 = Very good quality. Very simply to use, but you can customize a lot if you would like to. Only one issue is automatic clean up on switch on and off and you can't left it on. For that price it's just great product from brand that never let me down. We bought this in the office for our receptionist so that she did not have to run to the kitchen to get clients coffee when they arrived.This also freed up the main machine for staff.Great success and really good coffee!!!! We spent a lot of time researching different coffee machines, finally persuaded my other half to get this one and we haven't been disappointed. I bought this machine less than 9 months ago. It all worked well until a few weeks ago when it started to pour water out of it. now I can't make any coffee. Its not a cheap machine. I would have expected better.